Can a real life ‘Toy Quest’ be better than Pokémon Go? Alexander Luzanov and Olesya Angelova-Gashitskaya. While the rest of the world is hunting Pokémons, St. Petersburg residents hunt for miniature porcelain dolls. According to legend, they are made by a mad puppeteer, who hides them throughout the city under cover of night. I met Alexander Luzanov and his assistant Olesya Angelova-Gashitskaya on Vasilevsky Island, where his dolls were first spotted. They are fragile things that fit in the palm of your hand, suddenly appearing in the cracks of old St. Petersburg houses. He named his project "Between Ecolo." "Sasha, they were broken again. You need to install them better, otherwise the dolls will always be stolen, even before people find them!" Olesya, a themed-quest designer, admonishes the artist. "Olesya, I installed them well, I literally sank them into the cement," he replies. "Someone came and broke them out deliberately, understand?" "Excuse me," Alexander turns to me. "The quest is five weeks long; two dolls appear every week. It is very fast, I spend all day and night in the studio..." No one pays the doll maker for his work, he buys all the materials with his own money. Dolls have been a passion for Alexander ever since childhood. According to the artist, he has long wanted to put his dolls on the streets. "We've learned that a doll is something from a salon, something that is in a room," he says. "The street is an unusual environment for dolls. Porcelain is considered a brittle material, but in reality, it is not afraid of our weather, rain and wind. It is only afraid of human impact." Alexander never thought of organizing quests for city residents. He just started installing porcelain dolls in unusual places around St. Petersburg, and as people began to find them, they thought it was a game – "Find the doll." Later, Alexander and his assistant Olesya decided to organize a themed quest. The dolls first appeared on Vasilyevsky Island. They were mockups, the first attempts to realize a long-standing idea. Suddenly, the dolls hidden among the island's back streets were found by a tourist group from Moscow. Photos appeared on the internet, the idea quickly gained popularity and people started searching for new dolls. "I watched in horror as pictures floated around Russian internet sites," Alexander says. "And everyone was looking for the creator! I tried to remain anonymous, because I knew that I would have to work twice as much. "But in the end I just did not have time to catch all the references about myself, and finally they got me," the artist adds with a laugh. After the first bursts of excitement, interpretations of the doll maker's creations made their way onto the internet. "Everyone started to think that this was a protest," Luzanov says. "Because everyone thinks that contemporary art is always a protest." Then the dolls took on a life of their own. Even before the quest, people invented routes, looking for new dolls. "Because the first dolls appeared in places where the fairytale Black Hen takes place, everybody thought that I was depicting the tale's characters," the artist continues. "We decided to play along with this idea, and I made a hen doll, which converts to Minister Chernushka" (Black Hen, or Living Underground is a tale by Anthony Pogorelsky, written in 1829, which is well-known in Russia; Minister Chernushka is a character in the tale – RBTH). The logistics of the quest and the website were created literally overnight. Every Monday, participants are given the first clue about where to look for the doll. Then, before the weekend, two more clues appear. It can be as simple as a picture of a tree near the place where the doll was installed. 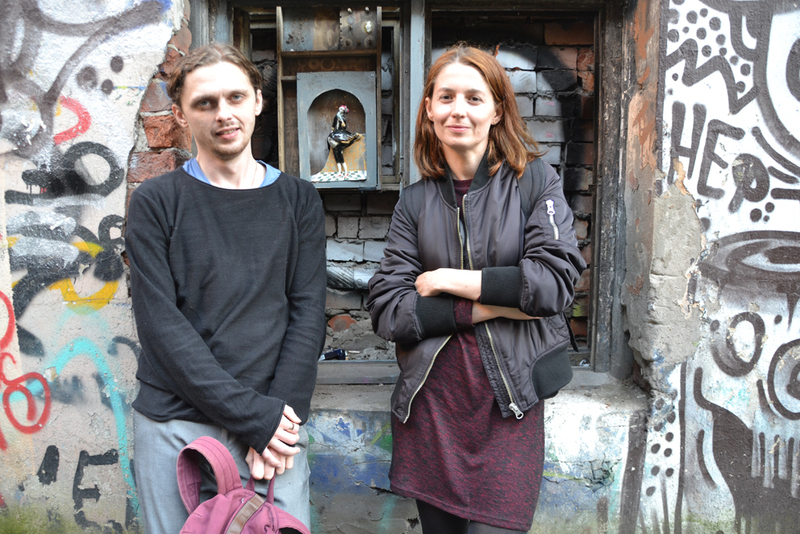 "I am always amazed how well people know the city, how quickly they find the dolls," Olesya says. "Sasha sets them at night, and the person who finds the doll first is invited to the installation of the next one." Initially, Sasha and Olesya thought that the invitation to join him for a doll's installation was a rather dubious prize. He usually does it at night, sometimes in the rain. But it turned out that participants are eager for the opportunity, regardless of the time or weather. "I even got a letter from a 12-year-old boy," Alexander continues. "He couldn't find the dolls from the clues, but really wanted to help me. I invited him to come in the fall to a school where I teach children how to make dolls." The quest involves about 100 loyal players. At one point, the doll maker got a letter from a poet in Cherepovets, who offered to write poetry on behalf of the Queen of the Night – one of the dolls. The Queen now has her own Instagram page and a lot of fans. "Imagine, a person comes home after finding the doll," Olesya says. "And the Queen of the Night begins to write long rhymed texts to them... And the funny thing is that many do not sleep until 4 a.m., they're chatting online with the Queen of the Night in verse!" In early September, the quest will be complete, and the "mad puppeteer" really wants to do something together with the city. The team of Between Ecolo has already been invited to organize a similar "hunt" in Spain. According to Olesya, there is even a construction company that wants to order a quest, and the prize will be keys to an apartment.